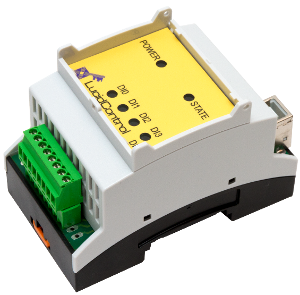 If you need a control and data acquisition solution for your project, LucidControl is the perfect solution because it is able to process analog and also digital signals. In order to run the USB IO Modules the only needed prerequisite is that is actually a connection with a a conventional USB port. The LucidControl USB IO modules are very affordable solution. Furthermore, they are ready for mobile and Internet based solutions and. The USB Digital Input Module is USB powered and there are no extra power adapters required. For reliable solutions it is additionally helpful that the input and output modules are prepared with high quality and industrial standard plug-able contacts. The flexible and also DIN-rail mountable enclosure makes the USB Digital IO module best suitable for the automation business since it enables their easy inclusion into switch cabinets. 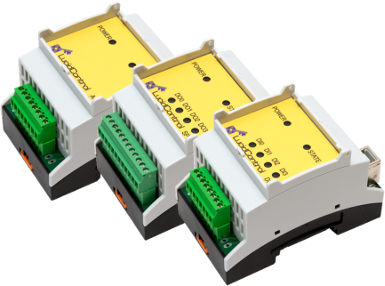 For the automation field the inexpensive IO module can also be added to distribution cabinets making it simple preparing a clean and straight forward design e.g. for measuring temperatures. Most OS such as Windows® and also Linux support the USB Digital Input Module out of the box without needing any driver installation. Most usable are the USB IO Modules modules also because of their compatibility with poplar embedded computer boards like the Raspberry Pi. Making use of Linux OS these embedded computers are very best prepared to create web based applications making all input and output capabilities accessible over the world wide web. The io modules are the best system for both, novices as well as professionals since they come with extensive development tools and also libraries for several development environments like .NET, Java and Python. This makes their usage totally simple. Learners can make their first automation programming steps with LucidControl and get profit from a big learning curve. 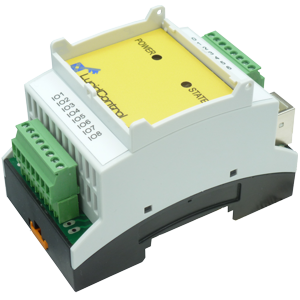 The USB Digital Input Module in combination with the USB Digital Output Module represent the two types of the LucidControl product range and manage the input and output of logic signals. 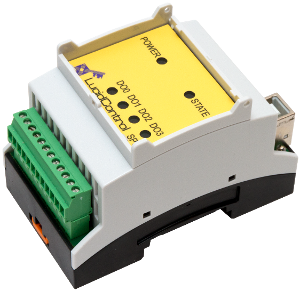 The USB Digital Input module was designed in order to supply digital level input lines and is best prepared to monitor up to 4 digital lines. The USB DIO module works with 5V, 10V and 24V voltage signal which are very common in the automation industry. In order to interact with third party automated systems, 24V voltages are processed generally. This method should really be chosen. These kind of digital inputs are also able to interact with other control systems or e.g. check conditions of switches. Many purposes are possible where digital lines are needed and digital input module is extremely flexible also because of their signal conditioning functions. One extraordinary useful function of the digital input module is the provided input signal filter that ensures high quality processing of digital input channels. In order to reduce communication between the host computer and the digital input module, edge detectors and counters enable realtime control of fast signal changes like raising edges. All logic channels are optical and potential isolated which means that the attached computer is to 100% protected from the input signals in order to guard the host computer to a maximum. Our companies goal is it to equip the digital input module with lots of interfaces to make the products ready for most sorts of applications. More details regarding the LucidControl input and output units can be found on our web-site or feel free to contact us. The USB Digital Input Module ensures signal detection without activity of the host computer which is crucial in order to ensure precise timing.